Dissociative identity disorder (D.I.D) is very complex in nature, up until the last decade not much light has been shed on both the structural and functional differences in patients with D.I.D compared to healthy controls. Recent literature illustrating the structural and functional neuroanatomical differences between those with D.I.D and healthy controls could possibly lead to future research on the neural mechanisms of D.I.D. Such mechanisms may also be discovered by extrapolating conclusions from the neuroanatomical structures specifically related to the symptoms of D.I.D (i.e memory impairment common in patients with D.I.D so hippocampus may be involved in D.I.D’s mechanism). It is important that we expand our currently limited knowledge on the neuroanatomical nature of D.I.D in order improve both pharmacological and behavioural treatment methods. In the past, finding structural differences in patients with D.I.D was unfathomable, however with the advent of newer technologies over the past ten years, a landmark paper by Vermetten et al. has demonstrated that patients diagnosed with D.I.D exhibit a bilateral reduction in hippocampal and amygdalar volumes1. This finding has immense implications for the unknown mechanism of D.I.D as such a pronounced localized difference in the neuroanatomical structures of D.I.D individuals and healthy controls provides us with distinct evidence that D.I.D is closely related to these brain structures that could possibly lead to very significant clinical implications in the future. This reduction in the hippocampal volumes can possibly be explained by the fact that many patients who are diagnosed with D.I.D have experienced trauma in their early developmental years of life. Another study reviewed the effects of early stress on the development of the hippocampus, and found that stressful events that occur while the brain is still undergoing major developmental changes impairs the viability of proliferating hippocampal cells due to the excitotoxic levels of CRH (a hormone released by the stress response) that are attenuated at the hippocampus by recurrent episodes of abuse that are characteristic of the history of patients with D.I.D. In light of finding that the hippocampus does in fact decrease in size in patients with D.I.D suggests a possible explanation for how memory loss, a symptom consistently exhibited by patients with D.I.D, is implicated in the disease as it is widely accepted that the hippocampus plays a large role in the formation of long-term memories. The possible implication of memory impairment attributed to the reduction of the hippocampi may be an explanation as to why patients with D.I.D have issues remembering the events that take place when they transition to a different identity. A similar result was found in order to explain the reduced volume of the amygdalae in response to fear, anxiety and stress in another study using a mouse model. Again, this relates to the fact that patients with D.I.D often have had some form of traumatic experience (inciting fear, anxiety and stress) early on in life thus explaining a size reduction of the amygdalae. The reduction of the amygdalae may also play an important role in one of the symptoms of D.I.D as it is a structure that is linked to the hippocampus at times, during the formation of long-term memories. As such, the shrinking of the amygdalae would imply further degradation of a patient’s ability to form long-term memories as well. The reduction of the amygdalae may also play a role in issues in emotional regulation relevant to patients with D.I.D. Thus, the bilateral structural reductions in both the hippocampi and the amygdalae can serve as possible biomarkers in those who possess certain risk factors for developing D.I.D allowing for preventative clinical measures to be taken. These two structures work in concert with each other in memory formation and so the reduction in these structures implies that they are important for the establishment of certain symptomologies, specifically memory impairment, in patients with D.I.D1. However these finding do little to suggest the mechanism of how patients transition between their various identities, but recent advancements in functional imaging have provided possible insight into how it may occur. Studies on the functional side of the neuroanatomy of D.I.D show promising results for future directions to discover the possible biological mechanism of the major symptoms of D.I.D. A recent study by Sar et al. has identified through the use of SPECT imaging techniques (using HMPAO as a tracer) that there is a marked decrease in regional cerebral blood flow bilaterally in patients with D.I.D at the orbitofrontal region of the brain as is illustrated in figure 1,. The orbitofrontal region of the brain is implicated in many higher order cognitive tasks such as the regulation of emotions and more importantly: the inhibitory control of information, which allows the brain to act selectively upon incoming information prior to further processing5. The study also found that blood flow was increased in the medial and superior frontal lobes as well as the temporal lobes in patients with D.I.D relative to healthy controls who had not suffered any type of childhood trauma however the effects were much more pronounced in the orbitofrontal region of the brain. This decrease in the orbitofrontal region of the brain further supports Forrest’s orbitofrontal hypothesis for dissociative identity disorder where it is proposed that the orbitofrontal region of the brain is the origin of where the distinct mental states of the disorder emanate themselves. This rationale behind this hypothesis leads back to early childhood trauma as the cause of D.I.D, due to the fact that the maturation of the orbitofrontal region is experience dependent, and those brought up in abusive environments by parents that exhibited both loving and detached methods of parenting, would therein created these distinct mental states at the orbitofrontal region due to that part of the brain’s lateral inhibition ,. The basic idea is that due to the vastly different ways in which the patient has been brought up will lead to two completely separate identities in the individual that are separated in the brain by these pseudo-barriers that have been created by lateral inhibition5. However an alternative interpretation of these results could suggest that the manifestations of the distinct mental states in D.I.D is not due to the active inhibition of the orbitofrontal region but instead is the result of a lack of organization in the brain of temporal information due to what is actually weakened inhibition at the specific area6. Figure 1. Comparative SPECT scan of an individual with D.I.D (Left) and a healthy control (Right). The D.I.D patient clearly exhibiting a decrease in regional cerebral blood flow in the orbitofrontal cortex as marked by the white arrows indicating the blue regions. The healthy individual on the other hand has full cerebral blood flow throughout the brain as is noted by the bright red colouring of the scans on the panels of the right hand side of the image. As could be predicted by the differences in the functional neuroanatomy between patients with D.I.D and healthy controls, the currently known neuroanatomical characteristics of D.I.D are also based off of changes in regional cerebral blood flow. In patients with D.I.D, the regional cerebral blood flow in the posterior associative cortices and the medial prefrontal cortex bilaterally when changing from one identity to another. This change exhibited by patients makes sense as the medial prefrontal cortex is strongly related to holding one’s conscious sense of self in the mind and so when transitioning from one identity to another, changes should be seen in this area. The function of the posterior associative cortices is crucial to the contribution of the medial prefrontal cortex’s to the symptomology of D.I.D. It is the posterior associative cortices that supply conscious information of which the medial prefrontal cortex would not be able to use in order to transition to a different identity without it. Not only is there a change in regional cerebral blood flow in specific areas when changing between different identities, but different areas of the brain are also activated depending on what kind of identity one is consciously experiencing and what kind of stimulus is being presented to the patient. There are two different types of identities that manifest themselves in D.I.D, one being the neutral identity state which is generally the state that patients are most often experiencing, as it is the identity that is protecting the patient from the traumatic identity state that is associated with traumatic memories. 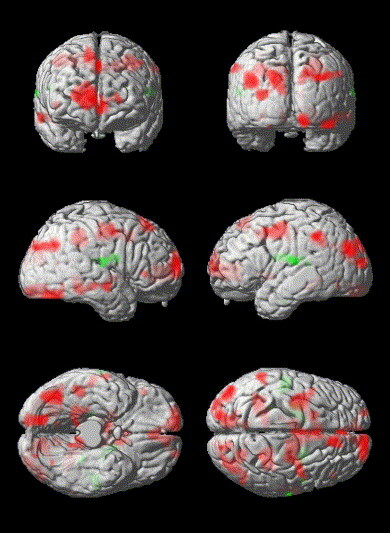 When patients are provoked into switching from their neutral identity state into their traumatic identity state in provocation studies (patients read scripts that provoked the switching into their traumatic identity state) and then shown traumatic stimuli, PET scans illustrate the difference in regional cerebral blood flow in different areas of the brain when in the two distinct identities as shown in figure 2. When in the traumatic identity state it is interesting to note that there is increased regional cerebral blood flow in the brain areas that deal the negative affective states such as the amygdala which is involved in the processing of fear as well as the basal ganglia which is involved in the processing of anxiety. There was however no consistent brain areas activated in the neutral identity state when presented with traumatic stimuli however there is very little overlap between the areas that are activated in the neutral identity state and the areas activated in the traumatic identity state when presented with traumatic stimuli. The neural identity state displayed cerebral blood flow that was reminiscent of a patient with depersonalization disorder, illustrating the idea that this is the identity state that protects the patient from reliving their traumatic experience8. This finding puts scientists on the right track to finding more concrete evidence of the neural circuits responsible for causing D.I.D and from there could possibly lead to more efficient clinical interventions. Figure 2. 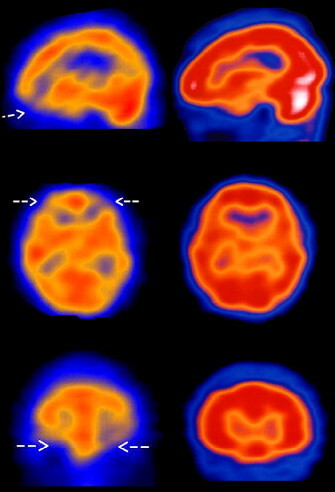 PET scans of D.I.D patients. Different areas of the brain are activated when the patients are in different dissociative states and are shown traumatic stimuli. When in the traumatic identity state, areas that process negative affect are activated (red) and when in the neutral state patients exhibit less activation in general exemplifying the neutral identity state’s protective function from traumatic stimuli. It is also notable that the two types of dissociative states do not activate the same areas when shown the same stimuli either. 1. Vermetten, E., Schmahl, C., Lindner, S., Loewenstein, R., & Bremner, J. (2006). 3. Packard, M. G., Cahill, L., & McGaugh, J. L. (1994). Amygdala modulation of hippocampal-dependent and caudate nucleus-dependent memory processes. Proceedings of the National Academy of Sciences, 91(18), 8477-8481. 4. Yang, R. J., Mozhui, K., Karlsson, R. M., Cameron, H. A., Williams, R. W., & Holmes, A. (2008). Variation in mouse basolateral amygdala volume is associated with differences in stress reactivity and fear learning. Neuropsychopharmacology, 33(11), 2595-2604. 5. Forrest, K. A. (2001). Toward an etiology of dissociative identity disorder: A neurodevelopmental approach. Consciousness and Cognition, 10(3), 259-293. 6. Sar, V., Unal, S. N., & Ozturk, E. (2007). Frontal and occipital perfusion changes in dissociative identity disorder. Psychiatry Research: Neuroimaging, 156(3), 217-223. 7. Reinders, A. A. T. S., Nijenhuis, E. R. S., Paans, A. M. J., Korf, J., Willemsen, A. T. M., & Den Boer, J. A. (2003). One brain, two selves. Neuroimage, 20(4), 2119-2125. 8. Reinders, A. A. T., Nijenhuis, E. R., Quak, J., Korf, J., Haaksma, J., Paans, A. M., … & den Boer, J. A. (2006). Psychobiological characteristics of dissociative identity disorder: A symptom provocation study. Biological psychiatry, 60(7), 730-740. Overall I enjoyed reading your neurowiki! I found it interesting to learn about the neuroanatomical differences in patients with DID. Also, I had the same thing happen with my images going across the entire page width (I found that you can break up the caption into shorter lines by pressing enter within the caption code). Great job! I found that the pictures with the long captions break up the flow of the page a little, but overall it was very interesting and the pictures do complement the information very well!